Ok so pasta salad can technically be eaten during any season, not just summer. There's no food law that says you must wait until June 21 to begin consuming pasta salad and immediately stop on September 22. But, why I'm calling this Summer Pasta Salad is because it's such a popular item to bring to cookouts and pool parties and what I love about this recipe is that there is no mayo! We've all seen the "I've been in the sun way too long mayo-based pasta salad" on just about every buffet table at every cookout. Another great thing about this one? It's so dang good the bowl will be empty before anyone even has time to question how long it sat out. A few notes on this...you definitely want to use small pasta like mini penne, mini bowtie, or shells. You can reduce the amount of sour cream and increase the French dressing our try it with a low fat sour cream. Be adventurous and add in a few other fixins if you'd like! 1. Cook pasta. 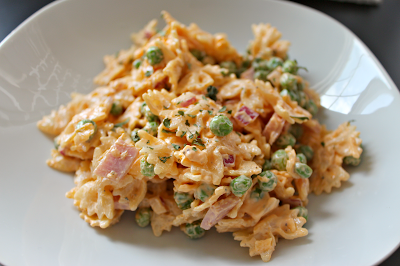 In a bowl, combine the cooked pasta, red onion, ham, and peas. 2. In another small bowl, mix the sour cream and French dressing, then season with the salt and pepper. 3. Add the dressing to the other ingredients and stir until coated. Pour in the shredded cheese and mix well. Chill for a few hours before serving.